Since a very young age, I’ve always been into competitive sport. As a national swimmer, I had to get myself up for 5am daily starts for training, evening sessions too to achieve my goals, however I was overweight as a teen through unhealthy eating (the look at a cake and put weight on type) and when I hit the age of 15, being an overweight teenager was hard in school. I soon developed an eating disorder of starving myself and binging which resulted in a lot of weight loss in a short period of time and a loss of periods for 18 months. This hit home hard when I became unwell and realised how important it is to look after your body the correct way. My passion for women’s health, nutrition and fitness grew daily as I graduated with a sports and exercise science degree (BSc Hons) at Essex University whilst working part time as Personal Trainer. I originally wanted to go into PE teaching, however my PT kicked off at David Lloyd becoming the most successful trainer at the Basildon club and achieving the most weight loss in the country for the Lose and Shape up 12 week course in 2012. I soon met my now husband Ray in the gym later that year and our passion for fitness grew together when we decided to launch our own fitness brand BodyByJR in March 2014. We competed for the first time in Miami Pro fitness model show October 2014, then again in April 2015, giving it a third time lucky April 2016 where I placed 4th Bikini Model in the world championships. Our wedding prep was the next ‘show’ for us in May 2017 achieving our best condition to date, however through 3 tough years of dieting on my body, I had lost my periods since my first show and it was only when we tied the knot, the realisation of our future kicked in. I also got diagnosed with an under active thyroid. Since January 2018, I have embarked on a new journey for my Amenorrhea recovery and embrace women’s health to a whole new level. I am proud to say that it took 8 hard months of a huge life change to function as a female again. Today, we still train clients that want to compete however we make them aware of the dangers behind extreme dieting. My new journey has made me even more passionate about helping females from eating disorders, PCOS, fertility issues, body dysmorphia, hypothyroidism, hypothalamic amenorrhea, to finding a healthy balance, achieving fat loss / weight loss goals and building muscle mass. In ten years, I have first hand experience on what the majority of teenagers go through to adult life and I pride myself on an open door policy to understand every emotion a female goes through battling body image day to day. After always being active throughout childhood, getting offered a semi professional football contract at the age of 16, I soon realised in my 9-5 accountancy office job that I didn’t belong behind a desk. I qualified as a personal trainer in August 2013 and since then I have worked with hundreds of males and females who have a variety of goals which they rely on me to help them achieve. 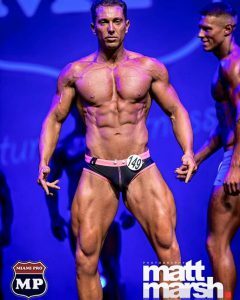 I wanted to push my own training and physique to the maximum and decided to compete in October 2013 with Jordan, walking away with 5th place Fitness Model out of 28 guys. I then continued to step on stage twice more and obtained PROFESSIONAL STATUS as a Fitness Model in the World Championships. After getting married in stage condition in May 2017, I have supported my wife throughout her recovery journey and we have found a healthy life balance which is vital.